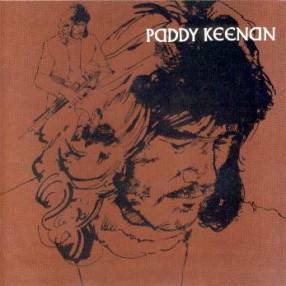 The uilleann piper Paddy Keenan’s 1975 debut album is the only one of the 2004 Gael Linn re-launch series which can justifiably be regarded as a genuine reissue (even if it was actually released officially for the first-time in CD format in 2003). That word “officially” is important here because Keenan himself became so frustrated by the album’s unavailability that he actually issued his own “unofficial” release a few years earlier which was, for a time, available solely via his Hot Conya Records website. Paddy had only revived his musical career in 1997 with the release of his first album for fourteen years, Na Keen Affair, but it remains puzzling why Gael Linn waited so long before making such a vital and influential album as his debut once again available. 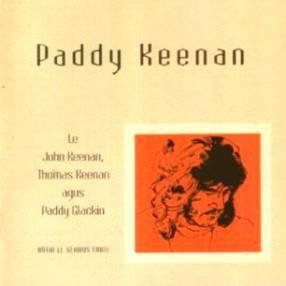 The original LP cover (depicted opposite) remains one of the most memorable of any ever issued by the label, Bill Bolger’s line drawing not only capturing Paddy’s contemporary hirsute appearance (and he has not changed physically very much in the interim) but the sheer intensity of his musicianship, eyes seemingly closed in concentration on his playing. The reverse of the sleeve carried extensive notes by Séamus Ennis in both Irish and English, although if the reader’s knowledge of the former was limited, she or he might have been left believing that Paddy Keenan was born in Mullingar in 1923 when, in fact, his birthplace was Trim and he was a mere twenty-five years old at the time of this record’s release. Unfortunately, while those notes are included in the reissued CD package and clarify that it was actually Paddy’s father John who was the Westmeath native, Gael Linn has made a hideous error in not reproducing the original album cover on the front of the liner booklet. Instead, the impact of Bolger’s artwork has been emasculated by, firstly, reducing the reproduction of his original picture from its original one hundred and forty-four square inches to a mere four. Furthermore, the richness of the original burnt sienna has been replaced by a rather sickly orange. The design is credited to someone or some agency called Bluett. Well, she, he, them or it certainly has! However, the designer must be praised for reinvesting the importance of the presence of Paddy’s brothers Johnny (banjo) and Thomas (whistle) and the fiddler Paddy Glackin. On the original sleeve their contribution was acknowledged merely by a brief note from Ennis and a cast-list credit in the bottom left-hand corner. Sadly, Johnny died a few years back without ever getting much publicized credit for his musicianship, though there’s nowadays an annual banjo festival held in Longford in his honour. Reference to those three musicians is important since Paddy Keenan is not, in the strictest sense of the word, a solo album. Indeed, Thomas has two strictly solo whistle outings, The Lark in the Strand and The Swallow’s Tail, while Johnny also has a couple of opportunities to demonstrate his picking skills on Tarbolton/The Longford Collector and The Job of Journeywork, as well as accompanying his piping brother elsewhere. Then there is Paddy Glackin’s contribution, a precursor to the album Doublin’ which he and Paddy Keenan would record for Tara in 1978. This incorporates one of the most staggering duets ever set on tape, their take-no-prisoners rendition of The Humours of Ballyconnell and Toss the Feathers. 1975 was the year when The Bothy Band came into existence and Paddy Keenan was about to become the most well-known uilleann piper in the musical world, a man whose lightning-fast chanter-work would lead Colin Irwin to describe him as the Jimi Hendrix of the instrument (though I don’t think Paddy ever played the regulators with his teeth). Séamus Ennis, in his notes, was eager to stress just how influential Johnny Doran was upon Keenan’s playing, though since Ireland’s most renowned travelling piper died in 1950, the year of Paddy’s birth, said inspiration actually came via John Keenan, Paddy’s father, who “spent many a night listening to him and playing along with him”. As a consummate piper himself, Ennis well knew his crans from his pops, and there is substantial evidence of the influence of Johnny Doran’s “open” style of playing in Paddy’s solo rendition of the double jigs Coppers and Brass and The Rambling Pitchfork, featuring remarkable harmonisation. However, there is perhaps no greater test of a piper’s skill than a slow air and Paddy gives his all on The Blackbird, a wonderfully drifting melody which transforms itself part way through into a long dance. However, perhaps the real sway of Doran is exhibited by the closing track’s unaccompanied playing of the reels Colonel Frazer and My Love is in Amerikay, a dazzling combination of legato runs, rolls, judicious use of the regulators and what Ennis refers to as “nipping out” or Johnny Doran “showing off”! It is simply soul inspiring. Paddy Keenan is surrounded by many “what might have been” tales. He could have continued his career busking as a guitarist on the London Underground in the late 1960s. He could have recorded with The Beatles, but, as he told me in an interview recently, instead of heading to the Abbey Road studios, he “got up and headed for Piccadilly with my colourful hippy girlfriend. I think it may have been shyness, insecurity or lack of education, all this from how we were seen as Pavees back home”. He might have stuck with a dreadful band called The Blacksmiths which recorded an equally dreadful LP for EMI in 1974. He could have been a member of Moving Hearts, but left after early rehearsals, suggesting that Davy Spillane be recruited in his place. Finally, he might have been lost to music for good after a long spell away during the 1980s. Thankfully, his enthusiasm was rekindled some fifteen years ago and he will be playing at this year’s Return to Camden Town festival in October, in conjunction with his now relatively long-term musical partner, the guitarist Tommy O’Sullivan. In the interim, savour the delights of this wonderful musician’s debut recording and marvel at his utterly beguiling marriage of unparalleled technical ability to an innate understanding of the essence of Ireland’s traditional music. A masterpiece! This review by Geoff Wallis was originally written for Musical Traditions - www.mustrad.org.uk. More information about Gael Linn can be found at www.gaellinn.com.